'The Blue City', because of the bright blue painted houses near the amazing Mehrangarh Fort, which seems to grow out of a rocky outcrop at the city's heart. And 'The Sun City', for the sunny weather in which this Thar Desert town basks year-round. This city is beautiful, historic, thriving, colourful and, as many more people are discovering each year, fascinating. 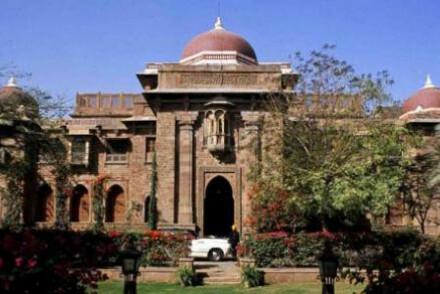 Here are some good reasons to visit, and some of the best places to stay in Jodhpur to enjoy them. Trade once drew people to this desert town. 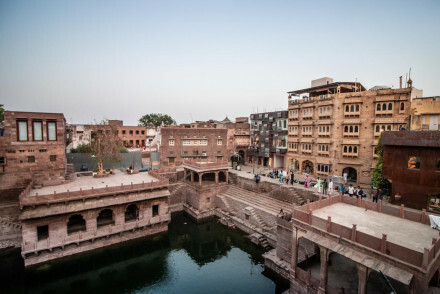 On the ancient silk route, Jodhpur is still the region's central market for camels, cotton and cattle. And trade is in this town's blood. It feels like you can buy anything and everything in the mass of shops and stalls which spread out from the Clock Tower in the centre of town. The Mehrangarh Fort, with its epic stone walls and many palaces inside, and the 20th Century sandstone palace of Umaid Bhawan are Jodhpur's two other main landmarks. This is due to their impressive scale and beauty, but they're by no means the only grand buildings worth closer inspection. Whilst most of the Umaid Bhawan Palace has been taken over by the Taj hotel, it's still a wonderful place to see and there's a fabulous collection of vintage cars on display that's worth the trip on its own. Bring a picnic and spend the afternoon wandering around Rao Jodha Desert Rock Park. With wonderful views of the city and an incredibly tranquil ambiance, it's the perfect way to take a break from busily sightseeing. Be sure to pass by the impressive Sachiya Mata Temple, whose walls are filled with lovely carvings and sculptures. The bustling Sardar Market is a great place to visit for those wanting to experience a true Indian street market. 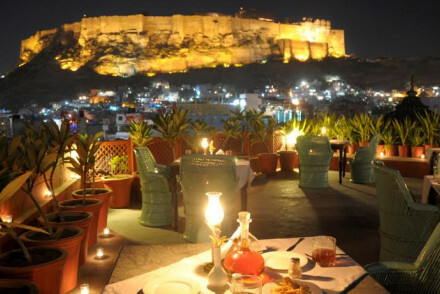 The Hotel Guru's selection of the best places to stay in Jodhpur offers a wide range from unbelievably good value guesthouses to Maharajah's Palaces turned luxury hotels. We cater for all budgets, but what none of our properties lack is attention to detail and an ethos of great service. 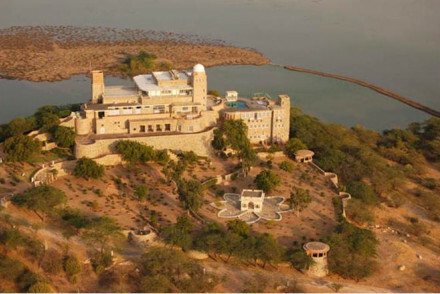 Built as a hunting lodge in the Art Deco style of the 30s, the Sardar Samand Lake Palace is still a favoured summer retreat of the Royal Family. The lake it's built beside keeps it cool, but it also makes it a great choice for birdwatchers. 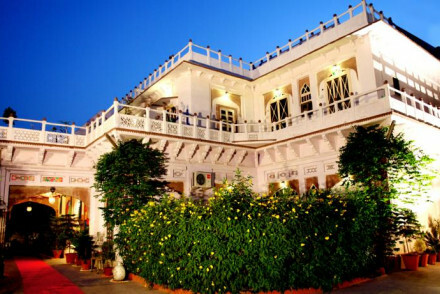 Bal Samand Lake Palace and Garden is another favourite of today's Royal Family. 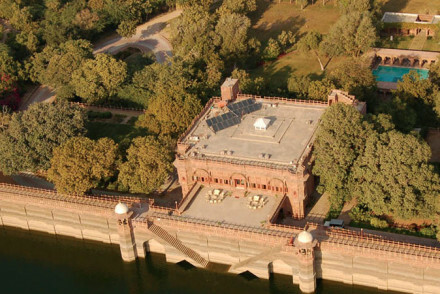 This summer palace overlooks a lake and 300 acres of beautifully landscaped grounds. Even if you stay in the rooms converted from the old stables, you'll still feel like a Maharaja. As well as peace here you'll find every luxury, a spa, as well as the chance to birdwatch, or ride up into the hills, or play golf. 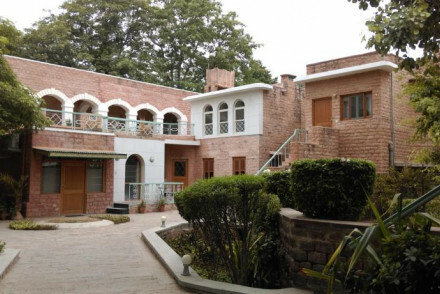 Ratan Villas, set in a 1920s family home, is a tranquil oasis in the centre of town. 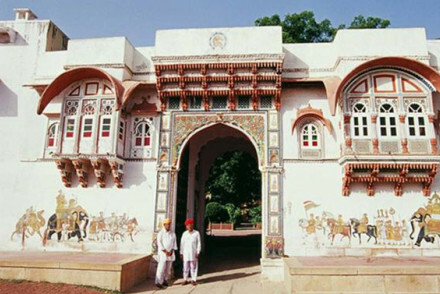 Offering charming traditional accommodation with period furniture and Indian fabrics, you can also enjoy typically Rajasthani entertainment each evening. The Wilderness Camp has a remote, desert location and seven luxurious tents - complete with large beds, rugs and modern bathrooms. Watch the sunset by the campfire. Inn Season offers a range of Art Deco rooms and suites in a peaceful residential neighbourhood. Spend your days relaxing by the pool or enjoying a good book in the flower-filled gardens, whilst massages are also available. Devi Bhawan is ideally located, just a short distance away from the city's sights and yet set amidst its own lush green gardens. The rooms are traditional in style and you can come back after a day out sightseeing to relax by the pool or enjoy a massage. In Jodhpur you're not limited to visiting cultural treasures during business hours. 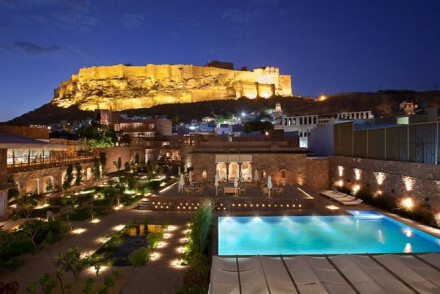 Many of the city's great palaces are now grand hotels and some of the best places to stay in Jodhpur. 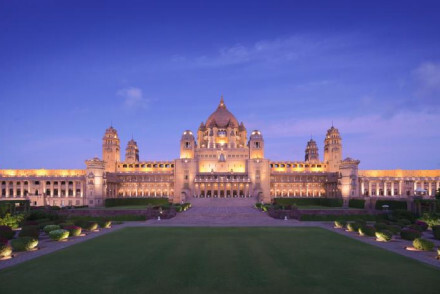 Umaid Bhawan Palace - if it seems familiar it could be because it's the landmark mentioned at the top of the page. 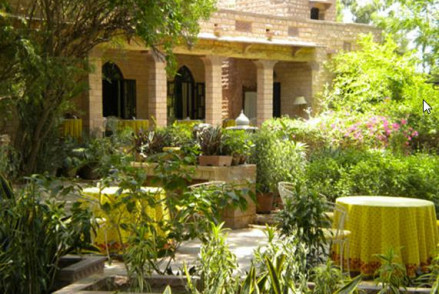 Yes, you CAN stay here, and it's definitely one of the best hotels in Jodhpur. Built by the grandfather of the present Maharaja this wonderful building with its vast proportions is famous all over India. Set in 26 acres of lush gardens, everything here is elegant and luxurious, from the squash courts to the billiards room and yoga studio. The Ajit Bhawan Palace belonged to the younger brother of the above, so you're still in good company. But with its variety of room options - including cottages, rooms and permanent tents, this is also ideal for families. For something less grand try Pal Haveli. 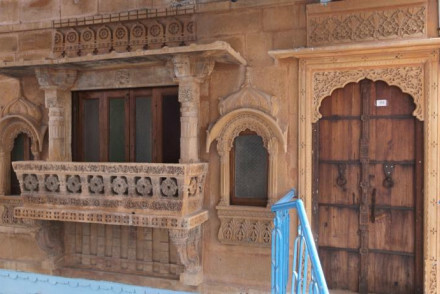 If you've not come across it before, a 'haveli' is basically a mansion, and probably one of architectural or historic significance. There are plenty of haveli options, but this one is one of our favourites in Jodhpur because its second restaurant is on a roof terrace from which you can see the whole city stretching out below. Priced from less than £50 a night, it is also perfect if you're on a budget. 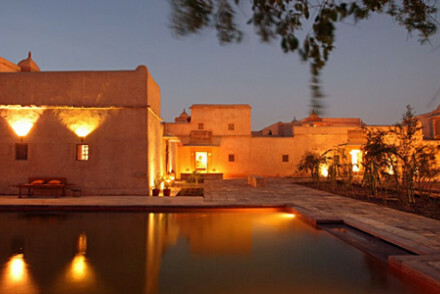 The Blue House is a superb all-round option, set in an historical 500-year old Haveli brimming with charm. Their spacious rooms, starting from just £16 per night, are filled with antiques and lovely views - what's not to love? 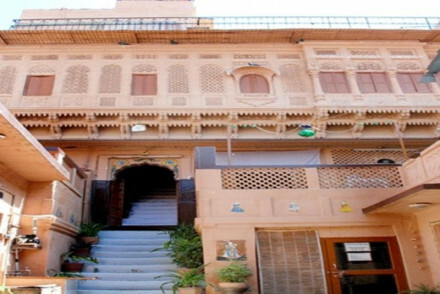 Singhvi's Haveli is a similarly ancient property, featuring individually decorated and extremely colourful rooms that are full of character. A truly authentic stay in a quieter part of town. 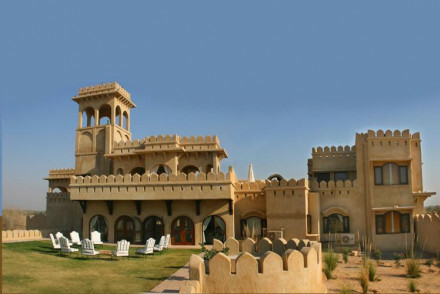 Mihir Garh offers luxurious accommodation in an historic property. Their Moroccan styled rooms include private courtyards with pools or jacuzzis, whilst there's also a lovely spa and top-notch cuisine. Wonderfully romantic! If your lifestyle requires reliable internet, convenient locale and comfort then Vivanta by Taj Hari Mahal should tick the boxes. Clean and quiet efficiency in a modern hotel which has been designed in the same way as a traditional palace. Sounds perfect? Well, it's also close to the airport, markets and the old town, whilst its spa offers yoga sessions. The best time to visit Jodhpur is from October to March, the winter months, when the temperature's cool enough to enjoy daily sightseeing (averaging between 19-28°C). Avoid coming in the summer, April to June, as the temperature can soar to over 40°C which makes it pretty uncomfortable for getting around and about. July to September constitute the off season, when prices will be lower but the humidity levels rise sharply, which may make it a little uncomfortable. At this time you're also likely to avoid many other tourists. Fly into Jodhpur Airport, (5km from the city centre), which is served by regular connections from Mumbai and Delhi which take just over an hour. British Airways, Jet Airways and Air India fly directly from Heathrow to both Mumbai and Delhi, with the flight time approximately 8-9 hours. From the airport, take a taxi or a rickshaw to the centre of town. 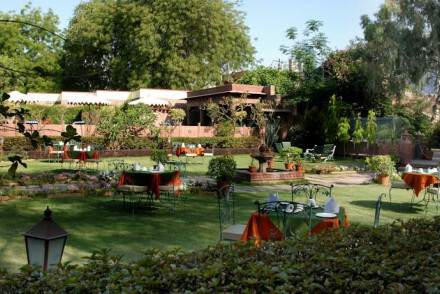 Browse our list of the best places to stay in Jodhpur and start to plan your visit. 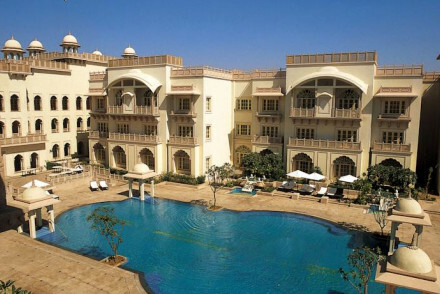 Alternatively, try all our recommendations in Rajasthan, Delhi or Jaipur. Or, if you're still feeling stuck then feel free to contact one of our friendly gurus for advice. Refined budget hotel ideal for discerning backpackers, with front-row seats of Toorji Ka Jhalra, an intricately designed stepwell. Fresh rooms feature elegant heritage decor, and there is a relaxed rooftop bar and restaurant with fine views of Mehrangarh Fort nearby. A cosy, practical base!